Posted on Fri, Jan 20, 2012 : 5:54 a.m.
A rendering by VOA Architects of the proposed apartment building presented to the Ann Arbor Planning Commission Thursday. This story has been updated to represent the position of the Old West Side Association regarding the project. The Ann Arbor Planning Commission unanimously voted Thursday to approve the development of 618 South Main, a new downtown apartment building. The project has been in the planning process for nearly a year and will now go before the Ann Arbor City Council in the coming weeks for final approval. 618 South Main will offer 190 studio, one-bedroom and two-bedroom apartments on one acre of land situated between Main Street and Ashley Street, bordering Mosley Street, at the location of the former Fox Tent & Awning. The project also includes a two-level underground parking garage with 121 parking spaces. When first proposed, the project was sectioned into two separate buildings, one lining Ashley Street and the other along South Main street. The new proposal showed the 153,133-square-foot building in an L-shape, following South Main and hooking around Mosley Street. 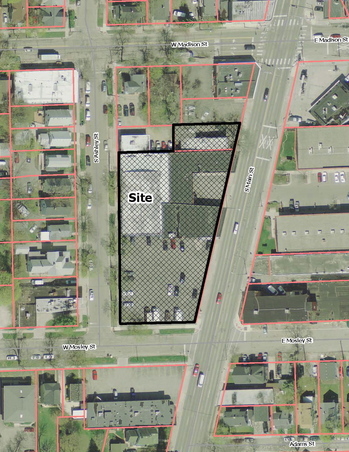 The developer is Dan Ketelaar of Ann Arbor-based Urban Group Development Co. The architect is Mike Siegel of Chicago-based VOA Architects. An aerial photo showing the land between Main Street and Ashley Street, bordering Mosley Street, at the location of the former Fox Tent & Awning. Ketelaar said the new design allows for a private courtyard on the west side of the property, but required upward expansion of the structure. The current plans measure the building at 85 feet tall, 25 feet higher than zoning restrictions for that area. “This is a very unique site,” Ketelaar said, “with east side is much more commercial and the west side is more historic. He also said if demand for parking spaces in the underground structures isn’t high, there is a potential to rent the spaces to others in the surrounding neighborhood. Members of the community expressing their opinion about the proposed apartment building also visited the Commission meeting. Murphy also said the apartments will bring in an added density of people, which she said will lead to increased retail traffic in the area. The Old West Side Association backs the project but presented a letter referencing their concerns, Murphy said. An ongoing concern since the project’s conception has been that added traffic could cause congestion to the area, said Eric Mahler, commission chairman. The structure will have two parking garage entrances, one on Ashley and the other on South Main. He and other commission member, recommended to the project planning team to research possible solutions before going for final approval before the City Council. One man, area resident Andrew Lindberry, expressed his concerns to the commission at the meeting before members voted on the project. Before voting on the proposal, Commission members Tony Derezinski and Erica Briggs expressed their thanks to the project team for its cooperation and reaction to the community’s feedback over the last year. “It’s good to see there’s been very little disagreement,” Briggs said about the current project plans. Contact reporter Danny Shaw at 734-623-2544 or dannyshaw@annarbor.com. Thu, Mar 22, 2012 : 1:01 a.m. I would like to know if there are enough suitable jobs (meaning will they pay enough to support renting a near downtown apartment) in downtown Ann Arbor to attract and keep all these outstanding young professionals. Has there been any major addition to the job scene since Google arrived...and if I recall, stayed stagnant with the number of employees? Will enough people really want to slog through the slush during winter months to get to their downtown job? And BTW, I live in the historic district of the OWS (almost 40 years) and still am grateful for my good fortune. A major charm about the OWS is something you can't see or experience in an afternoon. It is the diversity...of the housing stock (no two houses are the same)...of the residents. There is nothing positive about cynical comments on the split rail fence etc. Quit knocking what you obviously do not understand. Wed, Mar 21, 2012 : 9:26 p.m.
What happened to curves and peeks, and gargoyles keeper of the gate, sending evil spirits away? This building has all the mystique as a cardboard box on steroids. Quick easy, SNAP, SNAP, and done. Character is gone, and hasn't been back for a long time, and maybe gone forever. Old world designs were great, and they had some mystery and style. Fri, Jan 20, 2012 : 9:36 p.m.
gosh...looks just like the proposed apartment building on First and Washington which looks exactly like the Liberty Lofts condos....one rendering for all new proposed apartments in downtown? So much for diversity...and rents? Let's see, a one bdrm, loft style of 600 to 650 sf will probably be in the 1000 to 1150/month rate? Sun, Jan 22, 2012 : 12:34 a.m.
Fri, Jan 20, 2012 : 6:55 p.m.
&quot;This project would provide a nice thing to see when people enter the city,'' Not unless it looks a whole lot better than it does in the picture. Sat, Jan 21, 2012 : 2:34 p.m.
Fri, Jan 20, 2012 : 9:12 p.m.
Let's give it a chance. That was my first reaction also, but the space could (depending on texture, balance of architectural elements, etc.) be quite different than the building appears in this sketch. Fri, Jan 20, 2012 : 6:52 p.m.
Will this design allow for a wide sidewalk along Main, street trees, and bicycle lanes? If the building is so close to the street, that would not be a good thing. Fri, Jan 20, 2012 : 6:30 p.m. The industrial look of this huge building hardly cries &quot;welcome too Ann Arbor&quot;. Unfortunately, it goes along with the Justice building to the north which looks like a spacecraft hangar. Maybe someone will come up with a zillion dollars to create some &quot;public art&quot; to accent this structure. Fri, Jan 20, 2012 : 7:02 p.m.
Yeah, it could just as easily be &quot;welcome to Southfield&quot; or Troy, or Canton, or you name it. Ann Arbor has been losing it's charm and individuality since the early 80's. Fri, Jan 20, 2012 : 5:16 p.m. This project looks great (similar to Liberty Lofts). Happy to see the OWS embrace a little bit of change. They can see how both the Y and Liberty Loft developments enhanced their community. Fri, Jan 20, 2012 : 4:54 p.m.
To everyone who hates this idea, but also laments the fact that downtown (particularly Main Street) is turning into a giant food court: If more people live downtown, there will be more retailers within walking distance of those people. If there were more reasonably affordable places to live downtown, more people would live there, and Main street wouldn't just be the place to go for dinner and drinks. Fri, Jan 20, 2012 : 4:25 p.m. Cue the cranky old people's outcry chorus of reasons why this will ruin their charming old neighborhood. Instead of creating places where people might actually want to live, let's instead cling to our rickety old &quot;historic&quot; houses, which we'll inhabit until we're dead, and then pass along to our children, who will be just old enough to retire. That way, Ann Arbor will always be what it's best known as: a town full of grumpy old men and cat ladies. Oh wait, that's not right at all; A2 is a vibrant community where all ages and races are welcomed, a town that people want to live in long before they're 65. Times change, and those who don't adapt are left behind. Fri, Jan 20, 2012 : 9:11 p.m.
Bravo! I couldn't agree more! The &quot;old West side&quot; was just a bunch of overrated old factory workers' homes anywhere. This is near downtown and might make it an even better place to live! Fri, Jan 20, 2012 : 4:03 p.m.
Thumbs down. It still seems to me the supply is already greater than demand. I wonder if they ask the question of where will these new tennants come from? The &quot;If you build it, they will occupy it&quot; idea is bogus. There are no less than two other high rise projectes already underway downtown, then there's the new high rise on South U and Forrest where the old Village Corner used to be. They'd be better off putting up a parking structure or open air tree lined lot for football, Art Fair and other downtown shoppers. It may not look much better but would have more practical use. Sat, Jan 21, 2012 : 3:38 p.m. If the supply exceeds the demand, the prices will drop to meet them, which means more affordable housing options close to downtown. More affordable housing close to downtown means more retailers, and not a city full of restaurants. It's a win-win. If there are no groceries in close proximity to all the new downtown residents, someone will come along to fill the void. The economy works pretty well in that sense. Fri, Jan 20, 2012 : 10:14 p.m. Thanks to SMC, johnnya2 for the comments but I do get it and am paying attention. It appears the supply is rapidly outgaining demand. Occupancy rates are likely to drop off. Let's see, we have the Lofts, the Ashley Mews and the high rise at the corner of Huron and Ashley and oh; and one more approved on Main Street just south of Huron, then one more going up to east of Division and that may be more student driven. I am not against expansion. I am not a cranky old man but I fail to see the benefit in another high rise. It is great Ann Arbor is seeking expansion. If I lived in one of those dwellings, how close would I be to grocery stores? There are pros and cons. I will stick to my belief and hope Ann Arbor will expand in a more prudent manner. Fri, Jan 20, 2012 : 9:27 p.m.
Obviously you are not paying attention. Occupancy rates for these types of projects are very high. There may be a time when that will not be, but you do not stop doing something because in the future there might be too much supply. If this place is nicer and a better value to the public than say The Lakes of Ann Arbor, or Windmere (both of which just sold at record prices) then so be it. Fri, Jan 20, 2012 : 4:49 p.m.
Those other downtown high-rises are mostly for students, this one isn't. Fri, Jan 20, 2012 : 3:11 p.m.
Fri, Jan 20, 2012 : 9:35 p.m.
Fri, Jan 20, 2012 : 2:33 p.m.
Overture Audio has a great space there. I hope they can find another great location. Fri, Jan 20, 2012 : 2:18 p.m.
As long as there is no split wood fencing . . . .
Sun, Jan 22, 2012 : 12:25 a.m.
No. A new building is not subject to the same restrictions as a &quot;historically significant&quot; building in a historic district. No hypocrisy-- rather, it shows that historic districts are not all completely controlled by NIMBYs. Sat, Jan 21, 2012 : 1:57 a.m.
Its the fact that the people care about someone having a split rail fence on one side of the street are 100% backing a brand new 150,000 sq ft building on the other. Seems a little hypocritical, No? Fri, Jan 20, 2012 : 9:08 p.m.
Oh, get over it! If you move into an historical district you just can't do whatever you please. Fri, Jan 20, 2012 : 1:57 p.m. The housing component of this project comports with code requirements and often goes an extra measure. The proposal has been enhanced by the developer's efforts to speak to the concerns of neighbors at a series of meetings. In fact, the plan answers the question of how to buffer between downtown and historic, residential neighbhorhoods by moving the building toward Main Street and leaving room for a green area on Ashley. What is lamentable is that we lose three long-time businessess. If we are lucky, Delux Drapery, Overture Audio and Ivory Photo are displaced only temporarily. Businesses are the core component of any downtown area. Development without provision for commercial spaces is not in the best long-term interest of the community. Concentrating more people downtown will ultimately be most successful if we can provide the support services and products required. As has been said many times throughout this process, we need to look at the area as a whole and encourage proposals enhancing residential and commercial components. Fri, Jan 20, 2012 : 1:45 p.m.
Split rail fences are a no go on the old west side, but 150,000 square foot buildings, now those get 100% backing. Fri, Jan 20, 2012 : 1:37 p.m.
Fri, Jan 20, 2012 : 1:34 p.m. Cool! I actually kind of like it. Did they do any market research though? How many young professionals are sticking around Ann Arbor? Sat, Jan 21, 2012 : 6:02 p.m.
A house from the 1940s?!? On the OWS?!? I suppose there are some, but I'm thinking there are alot more from the late 1800s - early 1900s. Like the one I live in. Cold in the winter, hot in the summer, and a complete money pit. Time to build some new houses and tear down some of these old shacks with no more historic value than a used kleenex. Fri, Jan 20, 2012 : 9:40 p.m. There would be more young professionals living in Ann Arbor, if there were more housing that suited them. Call me crazy, but paying OWS money to live in a house from the 1940s, without so much as an attached garage is just slightly insane. Fri, Jan 20, 2012 : 1:18 p.m.
Looks sort of like an elementary school. That design is really going to depend on the materials, which are hard to discern from the drawing. Using ugly new brick like the Zaragons will make it look ugly. Using something nice will make it look nice. Sat, Jan 21, 2012 : 3:39 a.m.
Fri, Jan 20, 2012 : 1:12 p.m. The big question is what gives with 121 parking spaces for a 190 unit building? Am I going to be able to find a parking space so that I may enjoy natures most perfect food - a Washtenaw Dairy Donut?!!!!! Sun, Jan 22, 2012 : 2:41 a.m. The big question is what gives with 0 bike racks for a 190 unit building? Am I going to be able to find a bike rack so that I may enjoy natures most perfect food - a Washtenaw Dairy Donut?!!!!! Sat, Jan 21, 2012 : 2:18 p.m.
John Q &amp; SMC - Thanks for setting me straight with all of your facts! Fri, Jan 20, 2012 : 9:38 p.m.
Bingo, John Q. The people this will attract are probably working downtown already. Fri, Jan 20, 2012 : 9:37 p.m. I had to smile at the second question brought up by Arboriginal; although I've never tried their donuts I am addicted to Washtenaw Dairy's ice cream cones. The question of future available parking by their business hit me with the first reporting of Fox Tent and Awning's closing. Fri, Jan 20, 2012 : 6:06 p.m.
Not every tenant is going to need a parking space for a car. Fri, Jan 20, 2012 : 2:04 p.m.
Fri, Jan 20, 2012 : 11:41 a.m.
&quot;Barbara Murphy, vice president of the Old West Side Association. told Planning Commission members that the project was the &quot;beginning of a revitalization'' of the South Main area. "This project would provide a nice thing to see when people enter the city,'' she said. &quot;The general feeling is that this will be a good addition to our neighborhood. "&quot; OK, this seals it, I don't care about Ann Arbor anymore. Even though I was born at old St. Joe, completed all of my schooling there, worked all of my life there, and buried my family there at Forest Hills, it is time to let go. Let the young, hip, urban professionals from everywhere else have at it. Bulldoze the Old West Side, drive the less &quot;endowed&quot; folks to Ypsi, welcome all ugly developments with open arms, close down the streets for bicycle paths, buy a bunch of crappy art with the citizen's money, create more laws to &quot;protect&quot; the people, and obliterate any sense of history or home place. The people have spoken and my only wish is to leave the area as soon able and live amongst the real people who matter. Fri, Jan 20, 2012 : 9:07 p.m.
Much as we all have our &quot;favorite Ann Arbor&quot; based on our past histories there, things have to and always will change. Sounds like a good use of that land and a possibly good project to me. Move on, Ann Arbor. You'll always be a cool place to live. Fri, Jan 20, 2012 : 3:38 p.m.
Fri, Jan 20, 2012 : 1:06 p.m. I don't get it. There are crappy apartment buildings all over Ye Olde West Side. Hardly historical. Rents in said hysteric district are quite high. This might drive the rent on a ROOM in a house from $435 down to something the less endowed can afford. Fri, Jan 20, 2012 : 11:02 a.m.
&quot;The Old West Side Association backs the project 100 percent.&quot; Barbara Murphy, vice president of the Old West Side Association. Wow! That's an amazing and welcome endorsement for a worthy new project. Good job imagining, and then leading your neighborhood toward a cooperative and healthier future, OWS Association. Tue, May 22, 2012 : 12:33 p.m.